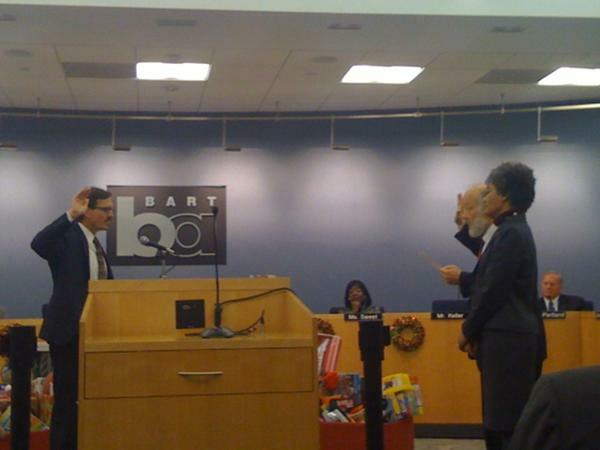 This morning, along with dozens of other transit advocates, I attended the swearing in of Robert Raburn to the BART Board of Directors. Raburn was sworn in by AC Transit Director Chris Peeples, which is meaningful as it symbolizes his commitment to work with AC Transit instead of against them and to work to better connect BART to other transit, biking, and walking. Alameda Mayor-elect Marie Gilmore and representatives of Congressman John Garamendi and Mayor-elect Jean Quan were also on hand to to support Raburn. I was so proud watching Raburn get sworn in – proud of how hard he, his wife, and his supporters worked to get him elected and proud of the stellar campaign we ran. Last year, when folks first started talking about finding a transit advocate to run against Carol Ward Allen, it was somewhat of a fantasy, and Robert made this dream a reality. His election proved that entrenched incumbents can be unseated, especially when they ignore their constituents and then rest on their incumbency to win them the election. And especially when their opponents run serious races and work hard to win. Many people have asked me – so what? Robert got elected and that’s great, but many have wondered if that will just mean all controversial votes will be 7-2 with Raburn and Tom Radulovich voting against the majority. I never thought this would be the general pattern. Sure, it might happen once in a while, but with two strong transit advocates on the board and other members now taking transit advocates (and their re-elections) more seriously, I foresee many more 5-4 votes occurring, and some of those decisions will end up in transit advocates’ favor. There’s some good news beyond Raburn’s election. Today the Board elected a new president – Bob Franklin. But before Franklin could speak, outgoing President James Fang (the only elected Republican in San Francisco) gave a very long self-congratulatory speech. He had the nerve to brag about about how BART is one of the most fiscally sound public agencies. Please tell me, in what world is borrowing hundreds of millions of dollars to to build an airport connector that will lose money annually fiscally sound? Fang then droned on about how many jobs BART has created and will create, saying that was the most important thing BART does. As I tweeted – Shorter Dir Fang – BART is about creating jobs, transit is just a bonus. Replacing aging cars – Yes, this is a huge priority! Except that Franklin says BART doesn’t have all the funds so will have to go to voters for more funds. Hmm, maybe some of that OAC money could have come in handy here. Improving community relations – Uh, yeah, hopefully by making substantial changes that the community supports. Improving relationships with employees – Also needs to happen to avoid another round of heated negotiations. Franklin then moved on to a really exciting possibility – extending BART hours on weekends! Years ago, when I was a transit rider but well before I knew the ins and outs of transit, I talked about running for BART Board on the platform of extending BART hours to 2:30am. Everyone I talked to at the time agreed with me – it would be so much easier to cross the bay for a a fun night out if BART ran later. Over the years, I learned more about transit operations and funding, and though it’s still one of my dreams, I didn’t think it would be a reality anytime soon. So to hear Franklin talk about this got me really excited. Franklin went on to mention the Make BART Trains run 24 hours Facebook page, which he said has 22,000 fans. Tom Radulovich chimed in, saying he was a fan of the page, drawing laughs from the crowd. Franklin said that if that many people have supported that page, it’s clear there’s demand for making the trains run later and that it should be studied. Streetsblog has a full story on the proposal, so if you want to learn more, check that out. So it’s clear that Franklin is interested in studying some serious changes to BART, and we know already that Raburn and Radulovich would support changes that improve BART for riders. But unfortunately the Board is still likely to be very divided next year. Fang’s speech showed that now as much as ever he sees BART as a job provider primarily and supports building extensions at any cost. And there’s likely to be push back from some of the other directors and staff. What this means is that advocacy will be more important than ever. We have a couple strong allies on the Board – Raburn and Radulovich – and at least one more who’s open to change, but they’ll need us to back them up to win over their allies. We need to send emails and show up hearings, and we need to help them change the debate. It’s going to be an exciting but challenging year for BART reformers, and I can’t wait. BART staff continue to ram the Oakland Airport Connector project through, despite huge risks to existing BART service and the fact that the project still doesn’t meet federal civil rights requirements. With the Oakland Airport Connector’s price tag of nearly $500,000,000 and anticipated operating costs of least $14 million a year, the Oakland Airport Connector will put BART so deep in debt that it will limit their ability to take out loans for critically-needed projects to fix the existing system, like replacing aging BART cars. This will likely lead to more fare increases and service cuts over time as BART riders have to foot the bill for BART’s bad decisions! Join us on Thursday, July 22nd at 8:45am for a short rally and then to speak at the BART Board meeting where they’ll have a final vote on whether to move ahead with the Oakland Airport Connector. The rally and meeting will be held at 344 20th Street in Oakland in the BART Board Room on the 3rd floor. Email me if you’ll attend and to get talking points. Email the BART Board today to urge them not to support moving ahead with the Oakland Airport Connector at this time. Thanks for helping us tell BART loud and clear that this project is simply too risky. So if you can make it tomorrow, please go and tell BART they’d be making a big mistake by moving forward. I unfortunately won’t be able to make it to this important meeting. Why? Well, I’ll be in Vegas (if my delayed flight ever takes off). This panel will examine how progressives are working to move California from being a failed state to a progressive laboratory for change, consider the opportunities and possibilities for fixing what has become broken and assess the obstacles the state still faces as we seek to restore the California Dream. California’s crisis continues, but we now have an opportunity to assess what needs to be done to provide solutions that meet the needs of all Californians. We’ll bring together progressive leaders from across the state to talk about the budget crisis, jobs and economic recovery, immigration reform and how activists in the netroots can help build coalitions with other groups and elected officials to produce change. And I’ll be joined by some pretty awesome panelists – Robert Cruickshank from Courage Campaign, Brian Leubitz from Calitics, Sally Lieber, former Assembly Speaker Pro Tem, Thomas Saenz, President of MALDEF, and Lindsey Horvath, member, West Hollywood City Council. I’m guessing most readers won’t make it to Vegas on such short notice, but if you’re interested in watching, you can watch online at 3pm tomorrow (Thursday). And if you want to follow the general fun of Netroots Nation, check out the #nn10 hashtag on Twitter. After almost exactly a year of trying to make the Oakland Airport Connector (OAC) project equitable and cost-effective, it looks like we’ve finally won the original battle. Back in February 2009, more than a 100 advocates urged the Metropolitan Transportation Commission (MTC) not to provide stimulus funds to the OAC and instead to provide the funds to all the regional transit agencies to prevent service cuts and fare hikes. MTC didn’t agree, but a year later, the Federal Transit Administration has told MTC that this is the only reasonable course of action. FTA sent a letter to BART and MTC today saying that there’s simply not enough time to implement BART’s corrective action plan that had been mandated by FTA, and that MTC should turn to plan B and revert the $70 million in stimulus funds back to the regional transit agencies. I am required to reject your plan for the following reasons. Based on the timelines submitted by BART, there is no way the agency can come into full compliance with Title VI by September 30, 2010. The requirements of ARRA dictate that any funds not disbursed by September 30, 2010, must be lapsed back to the Treasury. And since I cannot allow BART to draw any funds for the OAC project prior to coming into full compliance, it is clear that pursuit of the OAC project would result in the funds either being reallocated out of the Bay area or lapsed. Both scenarios are unacceptable to me as I am sure they are to you. Let me say that, based on FTA’s experience in other cities, BART is being realistic in admitting that the process of coming into full compliance will take considerably longer than the 8+ months that remain before the September 30 deadline. I appreciate and respect your honesty in this regard. Given the fact that the initial Title VI complaint against BART was well founded, I am not in a position to award the ARRA funds to BART while the agency remains out of compliance. Moreover, it is clear that, if FTA were to pursue such a course, the likelihood of protracted litigation with the parties that made the initial complaint is extremely high. Given this situation, and the fact that we are now only 3 weeks away from the March 5 deadline, I must bring these discussions to a close so that we can work together to ensure that the ARRA funds can create and preserve jobs in the Bay area. This is all very surreal. After so many losses, so many frustrating days and nights knowing that we were doing the right thing but still getting nowhere, it’s a bit hard to believe that the FTA has validated our arguments. I don’t know what BART’s next move is. I hope that they sit down with transit and social justice advocates and explore a more equitable bus rapid transit project. The Oakland Airport Connector could still be a highly successful project that creates jobs and provides a cheap and convenient connection to the airport. Regardless, $70 million in stimulus funds will go to good use, and I couldn’t be much happier about that. AC Transit desperately needs these funds. Muni can close their entire budget gap with these funds. And of course BART will greatly benefit from these funds. Thanks to everyone who’s pitched in over the past year. Our efforts have finally been proven to be well worth it. 8/11/09: Sign the Petition: Stop the Oakland Airport Connector – Demand a Better Connector! 7/21/09: Transportation Day of Action in Oakland Tomorrow! Disclosure: I am again doing some work for TransForm on the Oakland Airport Connector campaign. As you’ve no doubt heard, the Metropolitan Transportation Commission (MTC) voted last week to give BART a bit more time to convince the Federal Transit Administration (FTA) that it has its act together and can complete its equity analysis in time to secure stimulus funding for the Oakland Airport Connector (OAC). The drop dead date approved by MTC is February 16th – by that date, if FTA does not approve BART’s equity action plan, the $70 million in stimulus funds will be redistributed to the regional transit agencies that desperately need it. If FTA does approve BART’s action plan, MTC will meet on February 17th to vote on what to do. At that point, they can vote to keep the funds with BART for the OAC and pray that BART will follow through on its equity analysis. Or, they could vote to re-appropriate the funds to the transit agencies. So there are still two decision makers at play here – FTA and MTC. Many people have been asking me if there’s anything left to do. They want to take action. They want to make sure that the MTC does not roll the dice and gamble $70 million away, when the transit agencies desperately need it and BART has shown repeatedly that it is unable or unwilling to move forward with an equitable connector. The one year fight for an equitable connector is likely coming to an end – either we’ll be stuck with an unequitable overhead connector that does not improve transit to the airport and wastes the region’s limited funds, or BART will have to start over and will hopefully embrace the bus rapid transit alternative that TransForm proposed last year. There is one last thing you can do. Write to the FTA. Applaud them for their actions to date to ensure an equitable project, and urge them to insist that BART objectively and publicly complete the required civil rights analysis. It’s easy to do. Visit TransForm’s action page and personalize your message. I know you have a lot to say. Say it, but keep it civil and positive. FTA has shown that they care about equity and that they will hold BART accountable for its actions. Let’s make sure they continue to do this. Send an email now and ask your friends, family, and coworkers to do the same. provisionally support the OAC and “accept the risk that the funds could be lost to the region if BART fails to remedy any Title VI deficiencies to FTA’s satisfaction.” If commissioners choose this option, Heminger recommends mandating that BART submit its “action plan” to the FTA by February 16, 2010. If FTA should find deficiencies in BART’s action plan at that time, then Heminger recommends his commissioners program the money to transit operators for their operating budgets. How a reasonable person could believe that BART can get its act together on this project’s civil rights issues in just a couple of weeks when they’ve repeatedly failed to do so over the past year, I have no idea. But BART has always had MTC in some sort of trance when it comes to the Oakland Airport Connector, so why should that change now? You are being given a tremendous opportunity to do something great for the region. On Friday, January 15, the Federal Transit Administration (FTA) delivered a letter to BART and MTC explaining that the $70 million in ARRA stimulus funds are at risk of being lost to the Bay Area. These funds are at risk because BART has failed to conduct an equity analysis or to consider an equitable alternative to the controversial Oakland Airport Connector project. The Oakland Airport Connector has changed dramatically since you last voted to support it in February, 2009. BART has acknowledged that they are planning to serve a mere 600 new daily riders, at an average travel speed of only 23 mph. Instead of greater convenience, travelers will also have to drag their luggage 2-3 times further than they currently do from the BART train to the Airport. We have serious concerns that this project will not attract sufficient ridership to justify this significant public investment. The project has become so expensive and slow that it will not likely benefit anyone – BART riders, the airport, jobs, and especially low-income families who can’t afford to use it. When there is such an urgent need to preserve vital transit services, jeopardizing ARRA money on this questionable project is a risk we should not take. If the agency is considering continued support of the OAC, require an objective, independent analysis of the alternative the FTA is requesting before allowing any further regional funds to be committed. It should be an interesting meeting today. If you can’t make it, you can listen online or you can follow the meeting on Twitter. I think a lot of people will be live-tweeting, but this is the list I’ve compiled so far: OaklandBecks, MaxAllstadt, and StreetsblogSF. Tomorrow, the Metropolitan Transportation Commission (MTC) has the opportunity to do the right thing and reallocate $70 million in stimulus funds away from the Oakland Airport Connector (OAC) and to the transit agencies for maintenance. Whether they’ll do that or not, we don’t yet know, but one thing I do know is that the Bay Area blogosphere was on fire yesterday with bloggers urging the MTC not to gamble the region’s stimulus funds. Email the MTC commissioners using TransForm’s online action page. Come to the MTC meeting tomorrow and the Rally for Justice and Jobs before the meeting (beginning at 9am at MTC headquarters, 101 Eighth Street, Oakland). These blog posts are worth a read in full, but here are some of the highlights, that when strung together, tell the story in full. If you haven’t been following the story, BART is not proposing an extension to Oakland Airport like the one to SFO. What they’re proposing is a $492 million people mover, that will move slower than traffic for much of the journey. For comparison, the new station in Dublin is being built for about $80-$90 million. So for much less money, BART could build a new station at 98th Ave. and implement a bus rapid transit system (BRT), thereby improving service for airport riders and local residents. Last February, this issue sprang back from the dead when $340 million in stimulus (job creating money) became available. But here’s the thing, MTC never looked at whether the project was a good jobs creation vehicle. MTC did not perform/release any reports related to projected jobs created from stimulus funding. This fact, that MTC did not even consider the job creation potential of this project, was confirmed by KALW reporter Jill Replogle. BART mismanaged their planning of the project, changing it extensively over the years without adequately reviewing the changes. The MTC gave a large chunk of the federal stimulus money it received to the project, because the MTC totally hearts BART. Some local transit advocacy groups complained to the feds. The feds took a look at the project and were all like, ‘Woah, we can’t give money to a project that hasn’t been thoroughly vetted under Title VI of the Civil Rights Act,’ and told BART and the MTC to meet the Title VI requirements by March 5th or give up the money. BART Board President James Fang said he was puzzled and distressed by the letter because he believed that “FTA was one of our strongest partners on the Oakland Airport Connector.” But he said he was confident BART could satisfy the FTA in time to capture the funds. The next state of mortal grief is anger. We saw some of that in BART’s letter to the FTA, which said that “BART takes strong exception” to the idea that their policies favor rich suburban areas over poorer urban ones. BART appears to have moved on to bargaining, attempting to get a five-week stay of execution even though the inevitable federal rejection would cost the region its stimulus funding. Many expect a depressed BART staff when this comes to a head in at a meeting on the 27th. Seventy million dollars of the region’s transit funding depends on whether the regional Metropolitan Transportation Commission will find acceptance of the Airport Connector’s demise on Wednesday. However, there’s a silver lining. The Metropolitian Transportation Commission can vote this week to have the cash re-allocated to maintenance projects for Muni, BART, AC Transit and other looted transit agencies. Under the rules, this money cannot be used for big pay for anyone, only actual maintenance projects. This would be a good thing in a time of budget crapola. Personally, I think that if we’re going to see the feds spend money, the least they can do is spend it on something that might actually be of use, instead of blowing out the deficit for something that doesn’t help. Here’s the choice before the MTC Wednesday: give BART one last but impossible chance to save their Airport Connector and lose $70m forever, or keep the $70m for the region. The OAC, which becomes more expensive and less useful with every passing year, needs to be put out of its misery. Though the federal government won’t give the OAC a penny, BART has been willing to bankrupt every rival agency and steal from every available pot of money to fund their pipe dream, up to and including robbing their own seismic retrofit bond of funding to fix the Transbay Tube, so losing the FTA’s nod may not actually kill this zombie project. Even if you ignore the fact that the redirection of the $70 million to system preservation among local agencies will save more jobs than the entire OAC project will create, this decision should be a no brainer. The risk of just throwing away $70 million in stimulus funds is too high. First, it makes the MTC look like incompetent morons, and undoubtedly will render us ill poised to receive competitive grants in the future. Second, the impacts of losing the money are just too devastating to justify. This vote is a pivotal moment for the future of Bay Area transit: will MTC continue to stand by BART and its wasteful, suburban-oriented “blingfrastructure” project to cater to a few hundred new riders in 2020 in spite of the huge risks that now accompany it, or will they take a stand and prevent service cuts, fare increases, and hundreds of layoffs at transit agencies and support the needs of roughly 1,600,000-1,800,000 transit riders now? Nothing would be more embarrassing (and disastrous) for the Bay Area than losing $70 million in stimulus funds (well…other than actually building the OAC I guess). The bottom line is that this vote is MTC’s last chance to make the right choice–the choice that will increase transit ridership, improve service, cut our emissions and oil consumption, reduce congestion, and save jobs–and NOT fund the Oakland Airport Connector. Please click through and read all of these excellent job posts, and then take action online and make plans for tomorrow morning.